Shanghai Wisepool Real Estate Co. Ltd.
A water sensitive urban design concept creates a language of green street detailing. Rainwater is collected, cleansed through natural plant systems, and collected in a central waterbody. Small pedestrian neighborhoods are grouped together creating both privacy and community. 200 years old orchard trees have been retained and give the project playful maturity. This ecological infrastructure concept is vital to prevent brackish water from pushing in from the sea. 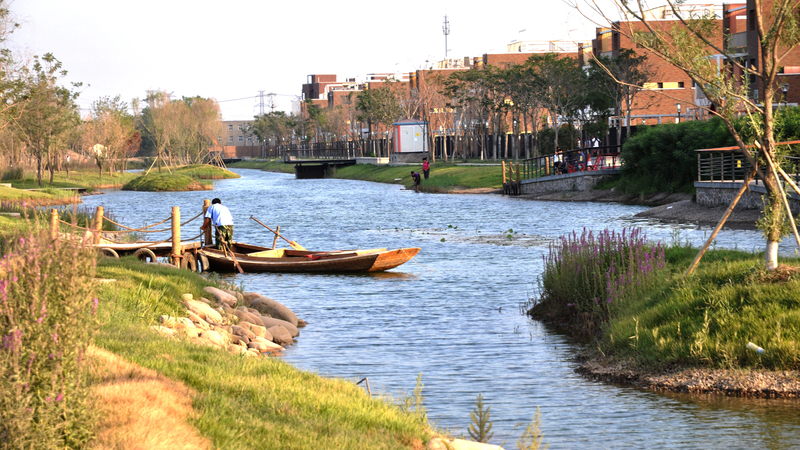 The Feng Chang River has been restored from a 30m wide polluted irrigation canal back into a beautiful, clean, natural river. The banks are softly shaped and planted - a flourishing ecology has rebalanced the natural biology of the water making the Feng Chang river a community asset and a focus point for leisure and socialising, as well as for safeguarding water resources.